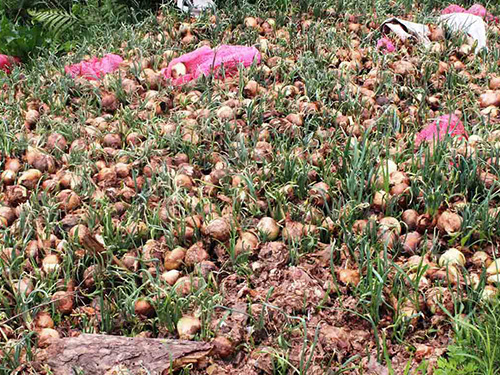 DA LAT (VNS) — Thousands of tonnes of onion in Da Lat City have been harvested, but growers are grappling with low consumption and demand. Nguyen Van Phap, the owner of a 4,000 sq.m onion farm in Da Lat, in the Central Highlands province of Lam Dong, said onion prices had dipped to their lowest level and domestic consumption had also been slow. "The region's onion farmers have never had to deal with slow consumption over the last few years," Phap, 40, said. The current prices of onion are pegged at VND2,000 to 2,300 per kilogram (kg), and only VND1,000 for dirtier onion. This is the lowest price during the last decade, Phap and some experienced farmers in Da Lat city, said. Phap's onion farm harvested a record output of 50 tonnes for the domestic market, However, a huge amount of onions had remained in storage the owner was looking for customers. "No one has come to my garden for a wholesale purchase. I have had to spend a sizeable amount hiring local employees to cut and put the harvested onions in storage," he said. Despite the current prices, the farmers have reported no profit. Some garden owners must pay money to build an additional store, hire local people and transport onion. Compared with previous years, during the harvest season, traders usually come directly to onion gardens to purchase onions at a price of VND5,500 to 6,000 per kg. Onions at many gardens are quickly sold out. Several owners, who had used considerable capital for long-term investment, had retained a sizeable amount of onions at the store, aiming to sell these products at a higher price in the coming months. A representative from the Lam Dong Province's Agriculture Department said the onion growing acreage in Da Lat and the two surrounding districts of Don Duong and Lac Duong had increased over the last few years, with total area of 1,000ha. He said the reason for the increase was that onion growers were not likely to suffer losses because onion could be stored and remained fresh even after three to four months. The disadvantage for onion growers during this period was the export market, the agriculture department officer said. During previous years, the two main export markets for Viet Nam's Central Highland region's onion were Singapore and South Korea. But following this year's harvest season, fewer companies in the two markets had come to sign a contract with onion growers.